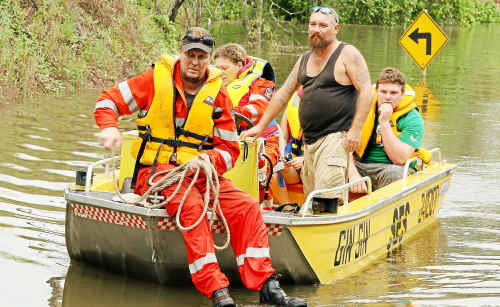 State Emergency Service volunteers Darren Coombes and Kellie Bolstad ferrying John Dickson, Phillip Lindsay and others across the flooded Perry River yesterday. ABOUT 200 people will be stranded at Booyal and Goodnight Scrub for up to a week, after the Burnett and Perry rivers flooded several bridges overnight Thursday. Residents are being ferried back and forth by the SES, with a bus provided by the Bundaberg Regional Council to take them to Gin Gin for school, work or shopping. Goodnight Scrub resident Sherrie Jarrett said she stocked up with a week’s supply of food, but being isolated was terrifying. “I’ve got an 18-month-old girl here — if anything happens, we can’t get out and an ambulance can’t get through to us,” Miss Jarrett said. University student Sean Miller said he caught the boat home yesterday to get his laptop and textbooks. “I’ll be boarding with a friend until it’s clear again, because the boat can only take three or four people at a time. I don’t think people realise how many people live here,” Mr Miller said. The SES boat leaves Goodnight Scrub at 5.45am and 10am, and return trips will be made at 2pm and 5pm, until the road is clear again. Bundaberg Regional Council manager for community care and social development Peter Watling said the shuttle service was put in place to help with essential community needs while the Booyal Crossing and Perry River bridges were flooded. “Booyal Crossing is too dangerous to cross — it’s fast flowing, and about six metres underwater,” he said. He said the flood waters were mostly from the overflowing Paradise Dam. “The roads often went under before the dam was built, but it hasn’t gone under for years,” Mr Watling said. Bundaberg Regional Councillor David Batt, whose portfolio is Disaster Management, said the dam’s water levels remained constant, and water levels at Walla Weir were rising but were expected to fall soon. “The current classification for flooding is minor to moderate and may cause some road closures in the region at low level crossings,” Cr Batt said. 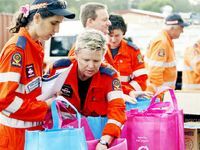 Bundaberg Region Mayor Lorraine Pyefinch said the Local Disaster Management Committee met at 3pm yesterday, and would continue a watching brief during the weekend. “We’ve got the council’s infrastructure crews out tonight, pre-emptively closing low-lying roads that we know are prone to flooding, and SES crews are on stand-by,” she said. She said about 90,000ML of water was flowing from the Burnett River into the ocean. “I’m just sad that so much water from our storage is going out to sea,” Cr Pyefinch said. The Bureau of Meteorology said there was moderate flooding along the lower Burnett from Mundubbera to Paradise Dam and at Walla, which was expected to ease during the weekend. But Bundaberg is still in the firing line, with minor flood levels of 3.5m expected on Sunday as the water overflowing from Paradise Dam moves towards the coast. “Paradise Dam is currently spilling with a flow of 1.8 metres over the spillway — this equates to 118,180 megalitres of flow per day,” a SunWater spokesman said.